Most of the time, when I think of prohibitive signs, I think of funny ones like those shown here. I make up signs like “No warthogs without a leash” and “Secondary personalities must be integrated before operating heavy machinery” and I crack myself up. But you know, these signs have a purpose in the real world. If you’re trying to maintain an area or change local behaviours, these signs are part of the solution. …except when they aren’t. Sometimes prohibitive signs backfire, as a new study just discovered. Kees Keizer, Siegwart Lindenberg and Linda Steg did a series of experiments in a large shopping area in the Netherlands. They picked an alley where people commonly parked bicycles and attached “Happy holidays” flyers from a fictional sportswear shop to each bicycle handlebar. The flyers were large enough that they had to be removed to use the handlebar easily, and there were no trash cans in the alley. What would the cyclists do with the flyers? As you might expect, it depended on the circumstances. When there were no prohibitive signs around, about half the cyclists littered (dropped the flyer in the alley). 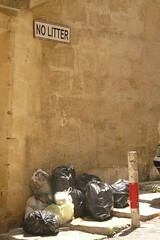 When there was a large sign with a “no littering” symbol on the wall, it cut the littering by about 10%. So far, so obvious. The interesting part is what happened when the researchers put their “no littering” sign in an alley that already contained litter. Not only did it fail to reduce littering (as it had in the clean alley), it made it worse: about 10% more people dropped their flyers. The research team tried the same experiment with a clean alley versus one covered in graffiti and found the same thing: even without actual litter, the presence of graffiti increased littering, and the presence of both graffiti and a “no graffiti” sign increased it even more. What’s going on? The researchers theorized that putting up the sign attracts the viewers’ attention to the “social norm” of keeping public areas clean. If they see that other people aren’t respecting that norm, they’ll be more likely to dismiss it themselves. Other studies by the same researchers support this theory. So, although it’s the messiest areas that seem to need the “keep it clean” signs most, they won’t do any good there, and they might do harm. Clean up, then put up the sign. Otherwise your sign might as well say, “Go ahead – everyone else does”, which would only keep away the contrary-minded, the obsessively disobedient, and cats. But I repeat myself.